On the way home last week, after an intense rainstorm, the kids and I saw this rainbow. 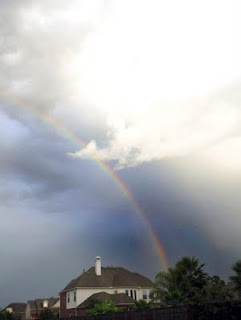 It was awe-inspiring to see this rainbow stretch across the sky with both ends visible from start to finish. Every Roy G Biv color stood out vividly, and at one point we could even see a double arch in the sky. Seeing this perfect rainbow initiated a lively conversation in the car, with the kids discussing everything from what causes a rainbow to is there really a pot of gold? From there, we discussed Noah and the rainbow God sent as his promise. Can we imagine that rainbow that appeared to Noah; would it have been as full and bright as this one, or more brilliant? Even on an ordinary day, God reminds us that He is with us everywhere.